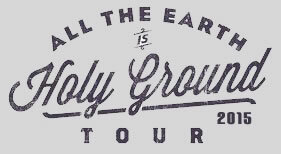 NASHVILLE, TENN. — Tenth Avenue North (Reunion Records) announces their fall headline tour “All The Earth Is Holy Ground” with special guests Sidewalk Prophets and newcomer Dan Bremnes. The 30-plus-city tour, sponsored by Compassion International and Palm Beach Atlantic University, will kick off on September 18 in Lynchburg, VA at Liberty University and conclude on November 11 in Round Rock, TX. See below for the complete list of dates. This tour follows in the footsteps of the newest Tenth Avenue North studio release Cathedrals, which is a beautiful collection of well-crafted songs that inspire community, encourage accountability and celebrate the fact we are not alone. It is this release and idea behind the album that has inspired the title and theme of this upcoming tour. Formed at Anderson University, founding members Dave Frey and Ben McDonald took their first steps in pursuit of their love of music, ministry, and community by writing and recording songs together initially in a dorm room. After touring with Jeremy Camp and Audio Adrenaline on the strength of independent albums, they made their Fervent Records (Word Entertainment) debut in 2009. Sidewalk Prophets has since earned a Billboard Music nomination (Top Christian Song- 2014), and have garnered 4 Dove Award nominations along with a Dove Award win for New Artist of the Year in 2010. Known for their love of their fan base, Sidewalk Prophets relentlessly tours the country over 200 dates each year, bringing a show filled with hit radio songs and heartfelt tunes with the goal of reaching people where they are for Christ. Their third studio album Something Different released August 28, 2015. For more information visit www.sidewalkprophets.com. When this singer and songwriter from Salmon Arm, British Columbia was just ten years old, he played drums at his local church while also learning guitar and discovering a passion for songwriting. As years passed it was a six-month missions trip in Australia with Youth With a Mission (YWAM) that re-shaped his perspective. As he was pursuing his professional dreams, Bremnes’ faced the tragic news that his mother was killed in a car accident. An event that truly turned his life upside down, there was no better way to honor his mother’s memory than by throwing himself wholeheartedly into music. He released his full-length debut on Capitol Christian Music Group earlier this summer titled, Where The Light Is. For more information visit www.danbremnes.com.